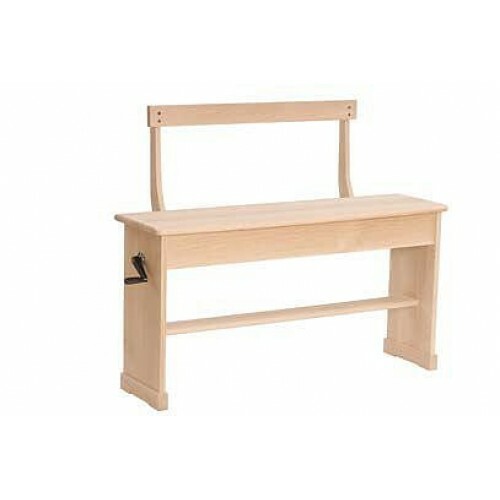 This bench comes already assembled with a benchtop that can be raised 2" higher than standard height, or dropped 1" lower. It comes with a foot rest, but no music compartment. An optional backrest can also be installed. Comes with a Red Walnut finish (picture displays unfinished bench). For custom colors please contact us. Adjusts 24" to 27" H, bench top 14" D x49-1/2" L, 45" between legs. Shipped from stock, 1-2 weeks if out of stock. Custom finishes will take longer to complete. Contact us directly regarding purchasing bench accessories.